Reference picture #5469, here's a picture of the unusual Dennis when it was still on the run at Middlesbrough. It looks far nicer with the red roof! Can anyone give an explanation of the half cab (using BUS terminology) design? Added by Barry on 19 January 2008. If you read the text on picture #5469 it give you the answer..
Added by Andy on 19 January 2008. I phographed this Dennis in the 1960s at its base station; the reason for the convertible top was because of a(maybe several) low bridges in the city. thet removable top was plastic or fibreglass, and at the time of my visit it had no rotating beacon. Added by Bob Grant on 20 January 2008. Added by Paul Pickford on 20 January 2008. My query with the design of this appliance is with the missing officer's seat and door. These would have not compromised the low height capability. Andy, I don't think this point has been answered in the previous posts? Added by Barry on 20 January 2008. Great picture Ian, thanks for putting it on this site. Its great to see this appliance when it was on the run. Added by Paul Warnock on 20 January 2008. Can you confirm the registration number of the Dennis F28 that you own ? Added by Ian Moore on 20 January 2008. Absolutely fantastic! A real favorite. One abstract idea that is keeping me amused, is that the OIC sat exposed to the elements R2D2 style (as he did in the X wing), and the locker above the front wheel arch is where he kept his goggles and a large supply of tooth picks, for removing the flies and other insects from his teeth. The reasoning behind it, perhaps he just was not very popular. Added by John Draysey on 20 January 2008. Sorry if you took my post the wrong way but if you look at the other picture it tells you the ladder is in a loccker that runs down the side of the appliance and that's why there is no door or space on the passenger side of the appliance. Then again maybe I read it wrong! Added by Andy on 20 January 2008. What should perhaps be added is that the 35' ladder was carried fully horizontally and internally, being accessed from the rear of the appliance. what was the height difference between this engine and an ordinary engine? Added by Pete on 21 January 2008. Sorry, I've got no excuse, I'd simply forgotten to answer your query. From the database, 703 LYA is shown as chassis 151F28A2, was part of WPO 41556, and ios shown as delivered in June 1961. The fact that it was registered three months earlier probably has no significance other than that it avoided the vehicle having to be delivered on trade plates. Added by Ian Moore on 26 January 2008. Added by Paul Pickford on 27 January 2008. This is FXG300 a WrT new in 1956 to Middlesbrough Fire Brigade.It was specially built to cope with a number of very low headroom Railway Bridges in several industrial locations on Teesside, the ladder is carried inside the body, and the Machine currently exists in storage awaiting restoration. It is also one of the few (if not the only) Middlesbrough appliances to be built with unpainted aluminium areas, as opposed to being Red, this was done on the grounds of cost. The roof section was made of glass fibre, and was detatchable. It is seen at it's home base on Park Road South in Middlesbrough shortly after the formation of Teesside Fire Brigade around 1968 as evidenced by the Teesside crest on the bodyside. It was I believe withdrawn around 1969/70. Added by Chris Hall, Teesside. on 27 March 2008. Another great pic of a very unique machine in service. Pat....it was a four man drill to remove the roof.......the vehicle was delivered without the roof......that was added several years later. The power feed to the beacon terminated in a detchable plug and socket. The appliance also had a Francis rolling siren which is just in front of the bell....however the mirror obscures the siren. Just to confirm the o.i.c's position is immeadiatly behind the driver! Added by Barrie Green on 13 September 2008. Re the low profile, according to the Firemen at Central Station when "on the run"it was for use on the Docks and Steelworks areas only, due to the very low railway bridges it was able to gain access anyware quickly while normal sized backup appliances took the long route around the Docks /Steelworks ect areas. Added by Peter Ashpool on 27 September 2008. This unique appliance may be now available for private ownership. It would be nice if it could stay in the North East on home territory. Please contact me for further details. Added by Barry on 06 November 2008. Leyland Merryweather Turntable Ladder [Aerial Ladder] with same seating arrangement, and no roof; in picture #12167. Added by Pat Rivers-Bowerman on 07 November 2008. Added by Barrie Green on 08 November 2008. Unfortunately the Council Depot in Billingham on Teesside, where this and another vintage fire appliance were kept, has suffered a disastrous fire (Nov 08)It is not known at this moment in time, if they have survived the fire. Should I find out I will let you know. Added by Chris Hall Teesside UK. on 08 November 2008. I am going to try and get down to this depot on Tuesday and ask at the gates whether they know if they're still there! Added by James Stoker on 24 November 2008. 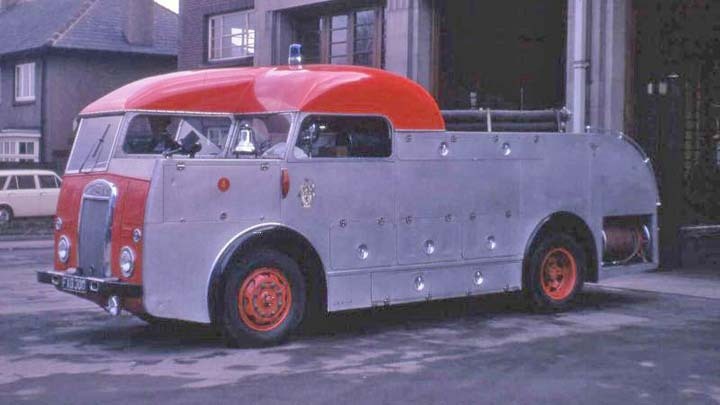 Would hope if this vehicle is ok a home could be found ie Sheffield Fire Museum, National Fire Museums Trust, or an identical transport museum, like the devon fb F8 it is a "one off"do Teesside F&R not have anyone who would be interested in looking after it? Added by Peter Ashpool on 25 November 2008. The security person on the site had no idea either... It would be nice if this and the other applience are still about! Added by James Stoker on 25 November 2008. The Sheffield Fire Museum used to have another former Teesside Machine. This was the former Hartlepool ET a Dennis/Miles (LEF927). It left Cleveland Fire Brigade c1978/9, and passed to an amateur Rock Band, and then to the Sheffield Museum. Then it disapeared.does anyone have any further information on this one's eventual fate? Added by Chris Hall Teesside UK. on 25 November 2008. Added by Barrie Green on 26 November 2008. Added by James Stoker on 27 November 2008. Added by James Stoker on 19 December 2008. Is it still there James ? Added by Barrie Green on 20 December 2008. These two are in the same store as the Dennis but it is hoped to get them all on display locally in the not too distant future. The Dennis S12 is definitely there... It is in the 'heavy' store where H&S prohibits visitors... I will bring more news when I can! Added by James Stoker on 20 December 2008. Glad to hear it's still about - hope they get it to show standard. Added by Pete Gardner on 13 February 2009. Added by Barrie Green on 13 February 2009. I am now 72 and have fond memories of the fleet of the then modern fleet. Added by John Goupillot on 05 August 2009. Added by Ian Mc on 05 August 2009. Added by Barrie Green on 05 August 2009. Added by Pete Ashpool on 05 August 2009. Hi 32 years Middlesbrough, Teesside, Cleveland, the driver was Barney Reid (now in NZ) when side taken out by Bulldozer on Linthorpe Rd. 2 roofs were provided 1st. (Black) was demolished by low (Metz) bridge Much practised 4 man drill to remove was forgotten Prior to roof being fitted crew would invariably run / climb over back and drop into crew compartment, save time. Was "good fun" to drive but being a Water Tender you had to watch out for the water moving / weight on corners. Added by Alan Swales on 26 February 2010. Added by Ian Mc on 27 February 2010. No actual photo's only the postcards which were issued as part of Fire Prevention, Fire Appliances, Fire boat, stations etc, presume you have a set of these , about 30 in all? Added by Alan Swales on 08 March 2010. Added by Ian Mc on 09 March 2010. Added by Mike Dalton on 23 November 2011. How can I contact Ian Moore to request permission to use one of his photographs? Added by Jim Bell on 04 July 2012. To contact contributors personally just click on the blue name, and sent a e-mail outside the group. Added by Marcel Sloover on 10 July 2012. With the closure of the Lorry Museum at ShildonThe cut down Dennis (and the K2 unit)has now been transfered to the North East Land Sea and Air Museum and will be moving to the Washington Site this comming weekend with the help of the TA REME recovery unit at Newton Acyliff. One of the Romney buildings on the site came from the Seal Sands works where it was used as a fire station so it might have an authentic home one day. The museum is the new name for the North East Aircraft Museum, it has merged with the Military Vehicle Museum ans shortly a Tram museum to encompass all forms of transport. Added by John Stelling on 30 October 2012. What about the Heavey unit and the Leyland, where have these gone . Added by Gordon Smith on 30 October 2012. Added by Ian Mc on 20 November 2012. My Dad was a fire fighter based on the Middlesbrough Fire Boat in the fifties and early sixties and we lived in the house just behind this appliance on the forecourt on Park Road South until he retired in 1964ish. When this appliance was in service it was known as the Comet. The other Dennis in service at the time had the wheeled escape ladder mounted topside. Added by Colin Burns on 09 November 2013. Added by Barrie Green on 09 November 2013. Hi Colin, thank you for your input but you are a little off with the "Comet". The Comet was a Leyland Comet limousine fire engine registered BXG600 that operated during the same time as this Dennis and the one with the wheeled escape "BDC333". Added by Ronald Henderson on 09 November 2013. Added by Martin on 25 November 2014. The Austin K2 heavy, previously mentioned is currently owned by North East Land Sea and Air Museum Sunderland where it is currently being restored. Added by Dave Todd on 30 December 2014. Added by Ronald Henderson on 30 December 2014. What else you moving up there to do the next line of Die-cast's... Would really like a Replica of My Wagons I've had over the Years!!! Take Care.. Yes the roof was removed when entering the dock area, because of the low bridge and the ladder was position in the left rear locker on its side. Added by James D Newcombe Ex Firemam M,bro on 09 June 2015.